Zamalek's versatile midfielder Omar Gaber completed his move to Basel on Tuesday and said he was relishing the challenge of living up to expectations. The 24-year-old became the fourth Egyptian player to join Basel in less than five years after penning a four-year contract with the Swiss side. Egyptian media reports said Basel will pay Zamalek 1.65 million euros to acquire Gaber's services. "I'm very happy to have joined Basel. 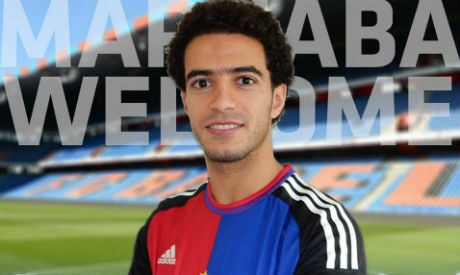 I'm sad to leave the club where I spent 19 years but I'm hoping to live up to the expectations of all people," Gaber, who will wear the number 4 kit, said in a video posted on Basel's official Facebook page. Gaber will be hoping to follow in the footsteps of fellow Egyptian internationals Mohamed Salah and Mohamed Elneny. Winger Salah spent two years at Basel before joining Chelsea, Fiorentina and AS Roma while central midfielder Elneny had a three-year stint with the Swiss giants before sealing a dream move to Arsenal last January. Attacking midfielder Ahmed Hamoudi had a less successful spell with Basel, joining Cairo club Zamalek last summer on a season-long loan. Gaber is a Zamalek fan favourite. He is a three-time Egypt Cup winner, and a one-time Egyptian Premier League holder with the club. A versatile midfielder who also plays as a right-back, Gaber has been a key player in the Egyptian national team since 2011.